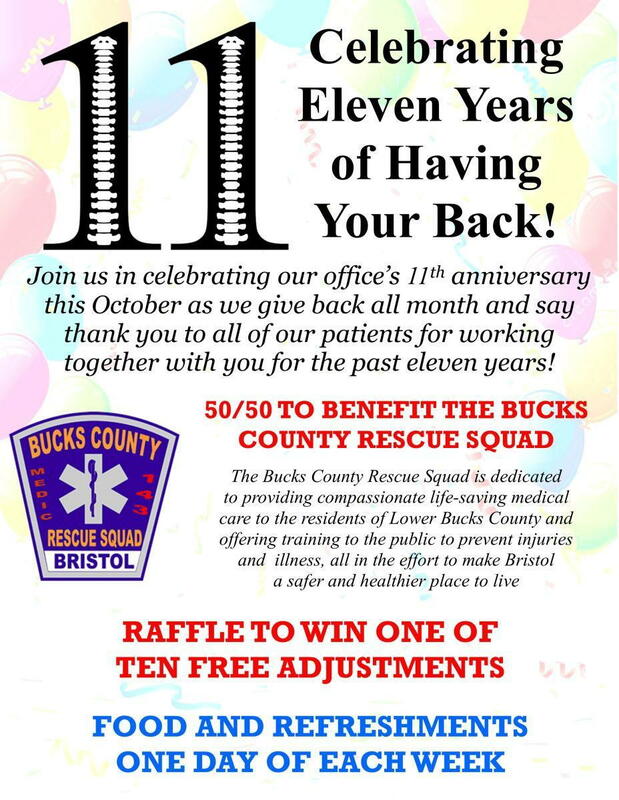 This October, we are extremely excited and proud to be celebrating our office's 11th anniversary of working together with all of our great patients and serving the Bristol Borough community and surrounding areas all month with our 2018 Patient Appreciation Month! We're using the entire month of October as our way of saying thank you and giving back to you, our patients, for another great year here at the office! Each year, we have a 50/50 to benefit one of the local organizations in town. This year's 50/50 will benefit the Bucks County Rescue Squad. The Bucks County Rescue Squad The Bucks County Rescue Squad is dedicated to providing compassionate, life-saving medical care to the residents of Lower Bucks County and offering training to the public to prevent injuries and illness, all in the effort to make Bristol a safer and healthier place to live. Tickets are $1 each, 5 tickets for $3 and 10 tickets for $5. Tickets are now available and will remain available until 12pm on Saturday, October 27th, when the winner will be drawn. In the past, we’ve done various raffle prizes and have used tickets and chances with different raffle baskets in helping determine the winners. This year, we are going away from these tickets and chances and instead, everyone who comes to the office next month will automatically be entered for a chance to win one of ten free adjustments! Finally, one day each week of October, we will have free food and drinks for everyone. Rather than having food and drinks each Saturday as we’ve done in the past, we’ll have some things for everyone one Monday afternoon, all day one Wednesday, all day one Friday and also on a Saturday morning. So for those who’ve become regulars on certain days of the week, we’ll have something for you for one of those days this month! Some days will be breakfast foods, other days we’ll have sandwiches and wraps, pizza, pretzels and some other snacks. So we’ll have you covered for something to eat at least one day a week through the month. Our Patient Appreciation Month is always a favorite time of the year at the office for us, not just for the fun atmosphere that they’ve all had, but more importantly because it gives us the opportunity to say thank you to you, our patients, for allowing us the opportunity to celebrate not only this past year, but the past eleven years of working together with you all, because we literally couldn’t have done it without you! We hope you’re all looking forward to October as much as we all are here!